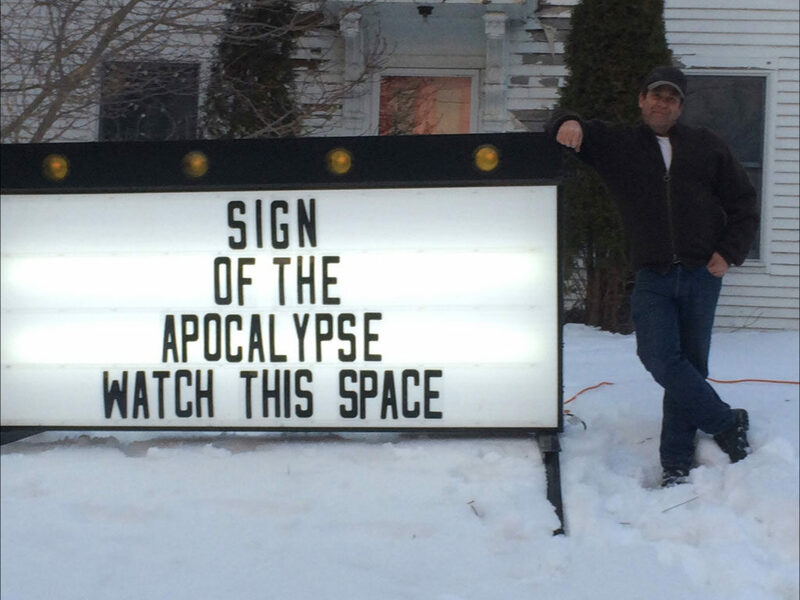 Life has been a little more interesting this past year for Arundel resident John Getchell, whose self-proclaimed “Sign of the Apocalypse” has caused the community to take notice. It all started last winter when Getchell saw the signs and letters for sale while shopping at Sam’s Club. Each day since Getchell has faithfully changed the message on the internally illuminated sign that greets fellow River Road travelers. “I knew some people were going to be amused, and some people were going to be annoyed by it. So I win either way,” said Getchell with a devilish laugh. 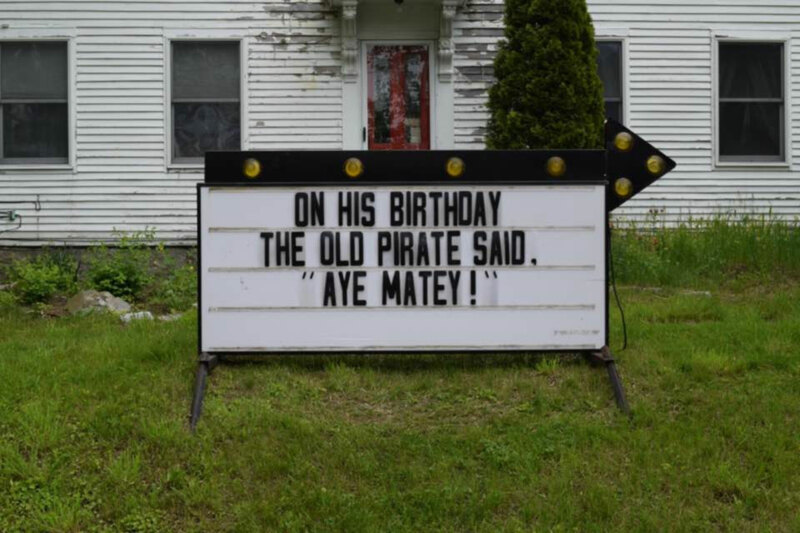 The humorous, free-spirited, self-employed carpenter said he likes to “literally challenge” those that read his messages with linguistic puns, words with multiple meanings, popular phrases with a twist, and sometimes messages in Latin. Some of the daily messages on the sign have read “Be the change you find in the sofa cushions,” “Pants are leg prisons,” and ”I scream, you scream, we all scream for ice cream” – written in Latin. “I thought, ‘$350 bucks, I can afford this.’ I knew right away I wanted to put it on my front yard and use it as my own analog Twitter,” he said. Occasionally, Getchell sends out a silly public message to a fictitious girlfriend named Wendy. “One of the messages read ‘Wendy, I’ll wear the yoga pants – text me.’ It was pretty funny. Some people thought there really was a Wendy I was reaching out to,” Getchell said. But there is one thing you won’t find on Getchell’s sign – offensive messages. And so far – it has been. The sign and messages have been shared via Facebook and Instagram, and there is even a Twitter following. Getchell, who has surrounded his sign with plastic pink flamingos “just for fun,” has recently added plastic black zombie flamingos for Halloween. He said countless people stop, take pictures, beep, give him the thumbs up and sometimes get out to pose in front of his sign on a daily basis. “A few sign followers have even left token gifts around it – such as garden gnomes, a Sasquatch statue, and a steel duck. The community has taken ownership of it which is cool. Another good thing is that the speeding on River Road has decreased dramatically since my sign has been up,” Getchell said. Fans of the sign need not worry about it going away anytime soon. Getchell said he has no plans to discontinue the “sign apocalypse” in the near future, and that he has some great ideas lined up for the holiday season. “I love that this sign, and the daily message, make people smile. This whole concept has taken on a life of its own. What started out as a goofy, quirky idea has brought happiness and laughter to countless people. That in itself makes it worth it,” he said.